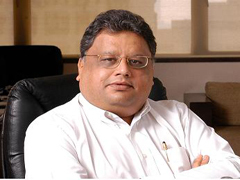 India’s best known stock investor, billionaire Rakesh Jhunjhunwala, is said to be ‘India’s Warren Buffett’. Rakesh is not on agreement for his comparison with Mr.Buffett. In terms of wealth and success and maturity, he’s far, far ahead,” says Jhunjhunwala in an interview at his office in a prime location in Mumbai overlooking the Arabian Sea. Much like the famed Omaha investor, Jhunjhunwala has made a fortune from some savvy investments – ‘Forbes’ magazine puts his net worth at $1.1 billion, ranking him 41st on India’s rich list. Dressed simply in a white shirt and grey pants, he draws heavily on a cigarette and pan. The 52-year-old rakesh is self-made man he built his fortune from an early bet on Tata Tea – and of a risk-taking investor. Unlike Buffett, Jhunjhunwala has been an advocate of leverage, which he has often used in his career and perhaps best defines his big, bold bet investment philosophy. “See, I’m a risk taker,” he says. “If I feel very opinionated, I can really put the money on the table. I don’t think too much deep research is needed. I don’t go into analysis paralysis,” he says. “All you need is common sense.” Let’s take a close look at his secret of success. If you don’t have confidence, you shouldn’t come to the stock market. You have to risk. But that risk should be calculative. “Trend is your best friend” he believes in this theory. Despite the concerns over weak governance & Indian economy, he’s still a believer in the India story that has made him rich. “When a child is sick, the mother is concerned. It doesn’t mean the child’s going to die,” he says. Many people search for stock which Rakesh has bought, and what he’s holding, People follow him like anything. Whenever they come to know that he’s taken a stake in a stock, they try to invest in it. So in order to fulfill our reader wish we are herewith his current portfolio. Rakesh jhunjunwala currently hold stocks in 34 companies. His maximum holding is in A2Z Maintenance & Titan Industries. Jhunjhunwala has no plans to leave his business to his three children or burning ambition to found a financial conglomerate, unlike other Indian billionaires such as Uday Kotak, who started small but went on to build Kotak Mahindra Bank.